The Stihl MS 180 Mini Boss has a slightly bigger engine than the MS 170. 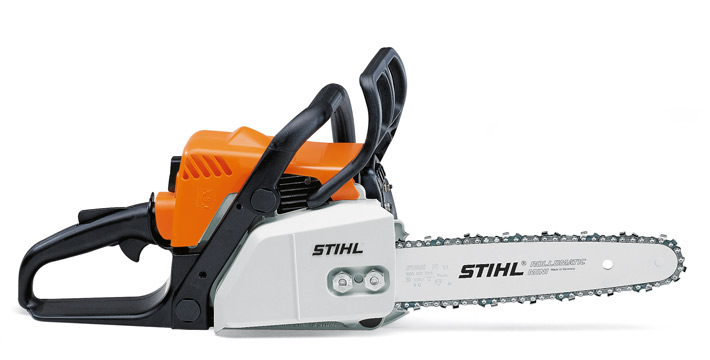 Its super light design and proven Stihl technology means you will be purchasing a saw you can trust. This saw can cut trees up to 30cm in diameter making it a very useful saw to own. Buying a Stihl saw means you can have access to a wide range of spare parts whilst also having dealer support behind the product your purchasing which is highly valuable in itself. The Features are listed in the tab below. On the side of the chainsaw, on the sprocket cover is an easily accessible screw to tighten the chain accordingly. 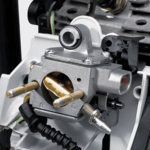 This handy feature prevents the operator from dealing with the shock caused by the compression of the engine when starting the saw. This is removed by the users joints and muscles through a spring or rubber element i in the starter handle.